Brazil's cerrado is an open woodland of short twisted trees. The diversity of animals is very great here, with several plants and animals that don't exist anywhere else on earth. Plants of the savannas are highly specialized to grow in this environment of long periods of drought. They have long tap roots that can reach the deep water table, thick bark to resist annual fires, trunks that can store water, and leaves that drop of during the winter to conserve water. The grasses have adaptations that discourage animals from grazing on them; some grasses are too sharp or bitter tasting for some animals, but not others, to eat. The side benefit of this is that every species of animal has something to eat. Different species will also eat different parts of the grass. Many grasses grow from the bottom up, so that the growth tissue doesn't get damaged by grazers. Many plants of the savanna also have storage organs like bulbs and corms for making it though the dry season. Most of the animals on the savanna have long legs or wings to be able to go on long migrations. Many burrow under ground to avoid the heat or raise their young. The savanna is a perfect place for birds of prey like hawks and buzzards. The wide, open plain provides them with a clear view of their prey, hot air updrafts keep them soaring, and there is the occasional tree to rest on or nest in. Animals don't sweat to lose body heat, so they lose it through panting or through large areas of exposed skin, or ears, like those of the elephant. In many parts of the savannas of Africa people have started using it to graze their cattle and goats. They don't move around and soon the grasses are completely eaten up. With no vegetation, the savanna turns into a desert. 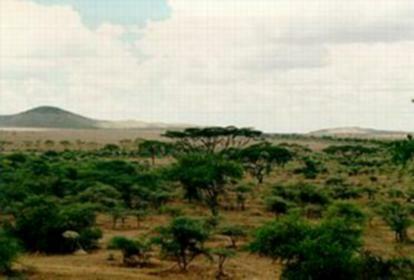 Huge areas of savanna are lost to the Sahara desert every year because of overgrazing and farming.